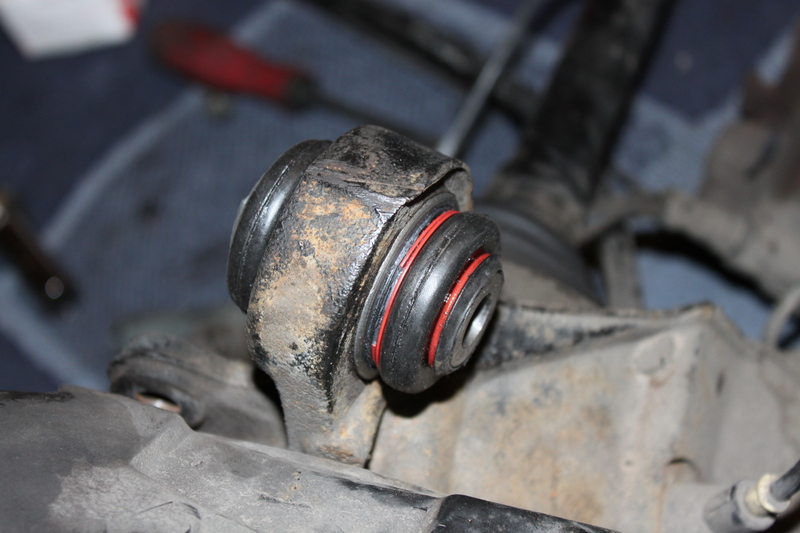 When doing a suspension refresh many owners often over look these four critical balljoints and bushings on the rear e36 suspension. 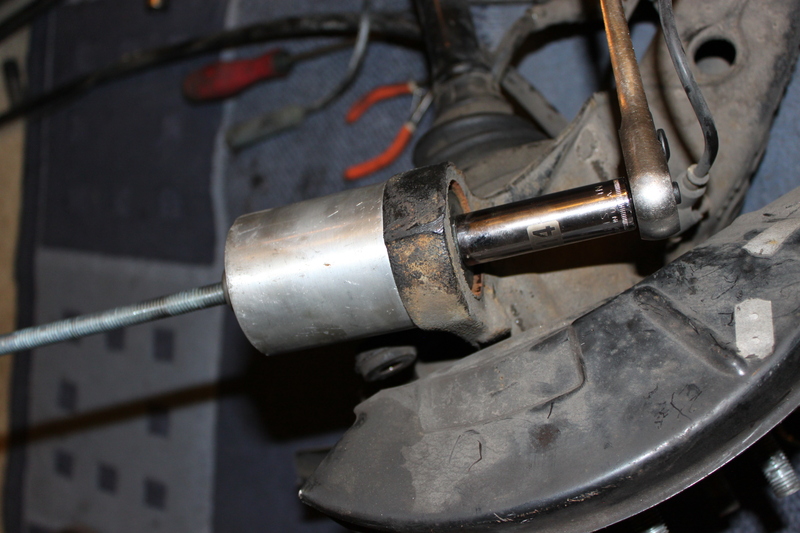 On each rear e36 control arm there is one lower balljoint and one upper bushing. 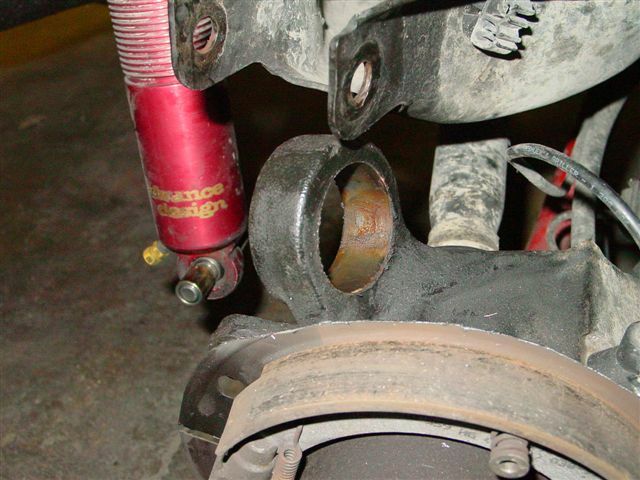 As an upgrade many owners choose to replace the stock upper bushing with the oem replacement lower ball joint. For this guide, you’ll need the following parts and tools. Support this free resource to the BMW community by purchasing your parts from our shop. The parts are available from other retailers as well. AKG (or similar) press tools, or you can construct a home made version. 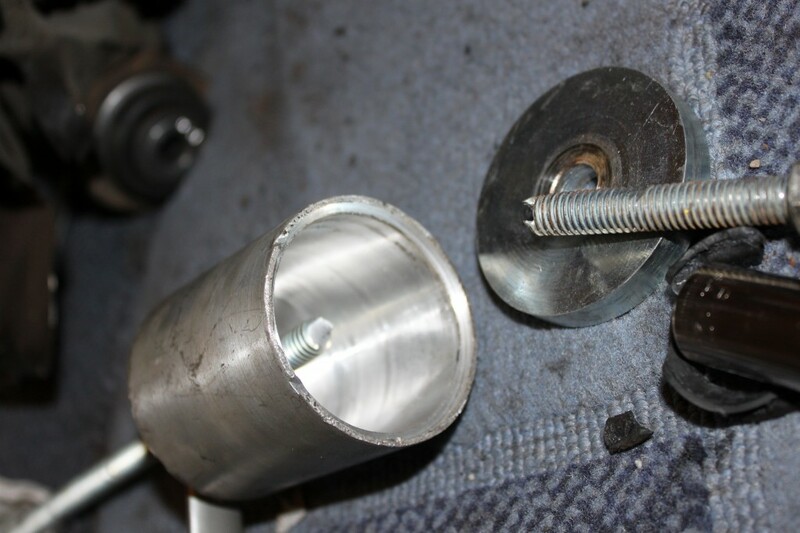 The install can be done with the hubs still mounted to the vehicle, however it will be necessary to remove the brake dust shields. 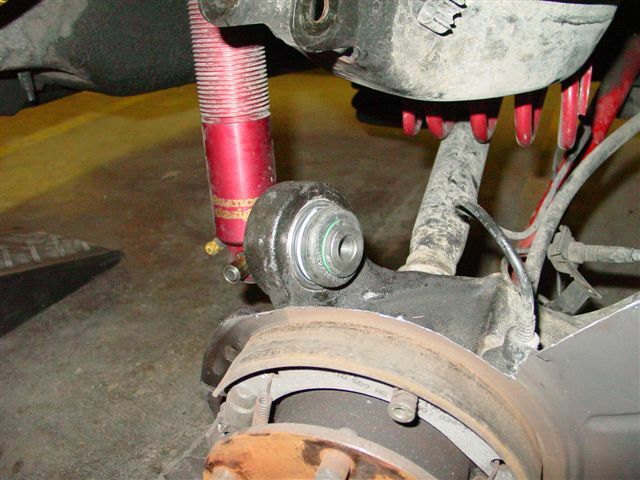 You will also need to remove the lower and upper outer control arm bolts, as well as the lower shock mount. Threaded 1/2 inch by 1.5 thread pitch rod, nuts, and washers. This e36 rear lower bushings replacement guide will be split into two parts, the first using the homemade tool kit, the second using the AKG subframe, diff, and other bushings kit, which may actually be NLA. Using the both kits it’s recommended to use some sort of lubricant on the threaded rod to reduce friction. 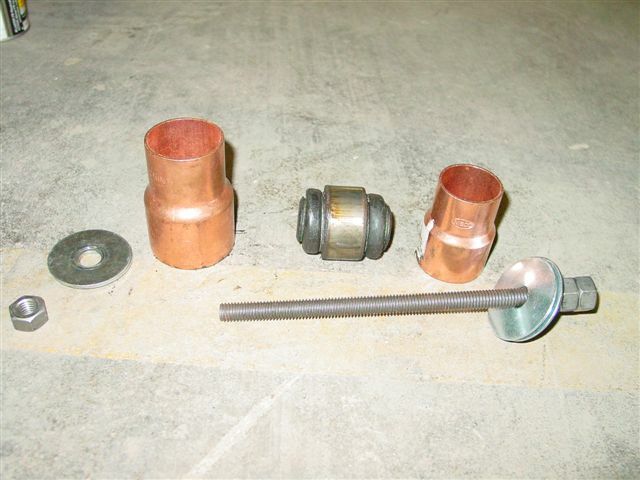 Copper pipe was chosen in order to minimize damage to the bushing, as copper is relatively soft. Again, on both methods it’s recommended anti seize compound or some sort of grease in applied to the inside of the bushing carrier. 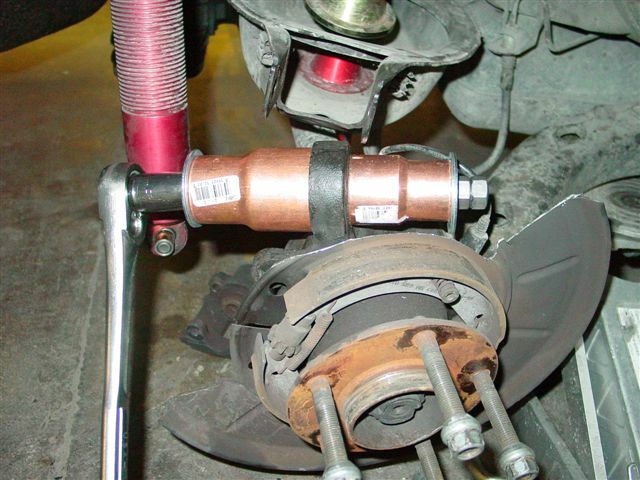 This serves two functions, reducing the chance of rust occurrence while minimizing friction between the two sufraces while installing the new ball joints. 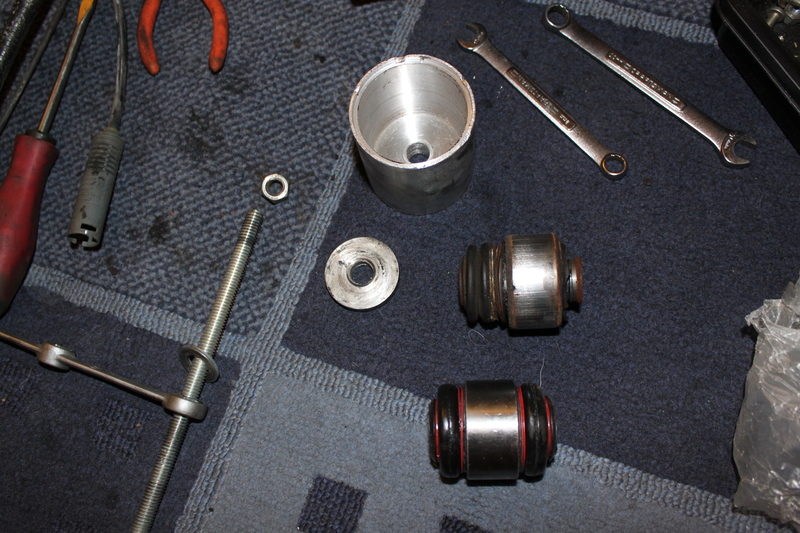 Here we can see the tool setup ready to press the old bushing out. The old bushing removed still in our home made bushing press. 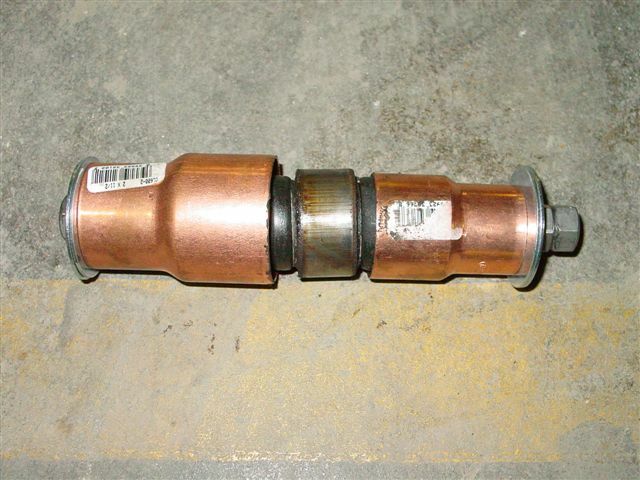 This shows the upper bushing location once the bushing is removed. 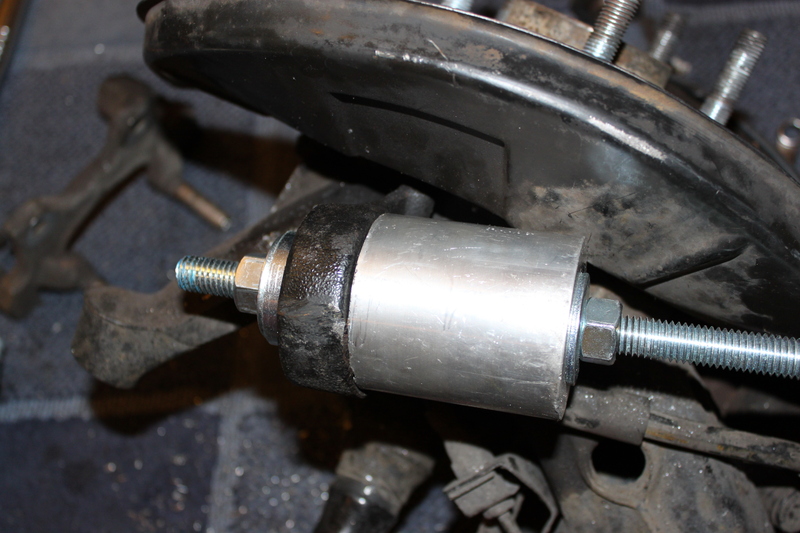 New bushing pressed in, pressing in the new balljoint on the e36 rear control arm is very similar to removal. 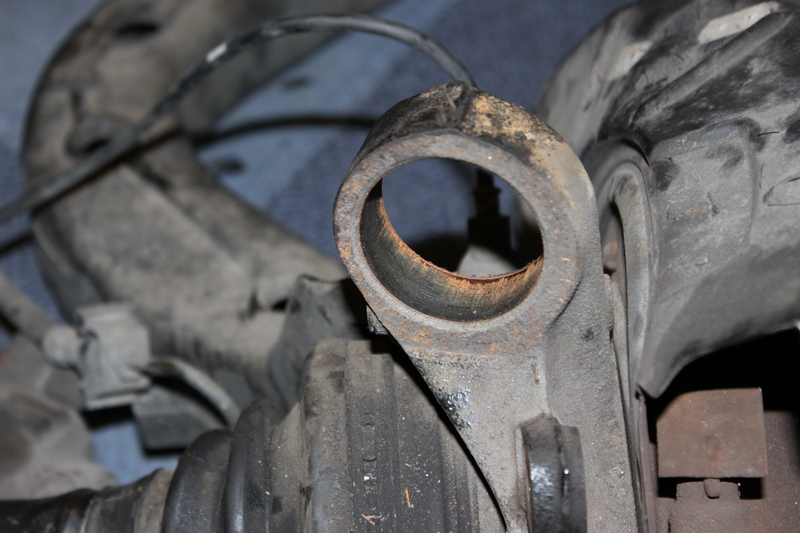 Both upper and lower upper rear balljoints installed on a e36 m3. 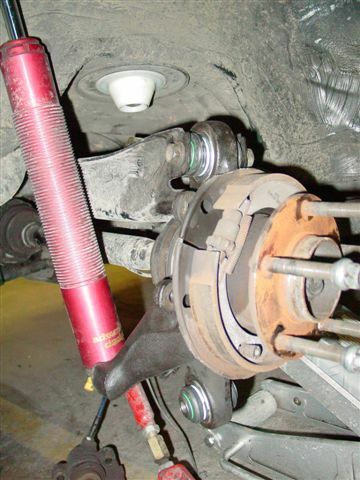 Using the AKG install tools, the method of extracting the old ball joints and bushings is virtually the same procedure. While the replacement can be done with the hub still mounted to the car, my hubs and control arms were already removed from the vehicle. As i was replacing my dust shields, I chose to simply bend them out of the way for the time being. If you want to make a replica of the AKG tool, I’ve provided the following dimensions below. The washer need to have a diameter of 4.5 mm, with an inside hole of 1.3mm or 1/2 inch. You’ll also need at least a 1/2 diameter threaded rod, washers, and bolts that can be found at any home depot. You will also need a 3/8ths threaded rod, washers, nuts, and 1/2 drill bit; i’ll explain later why. 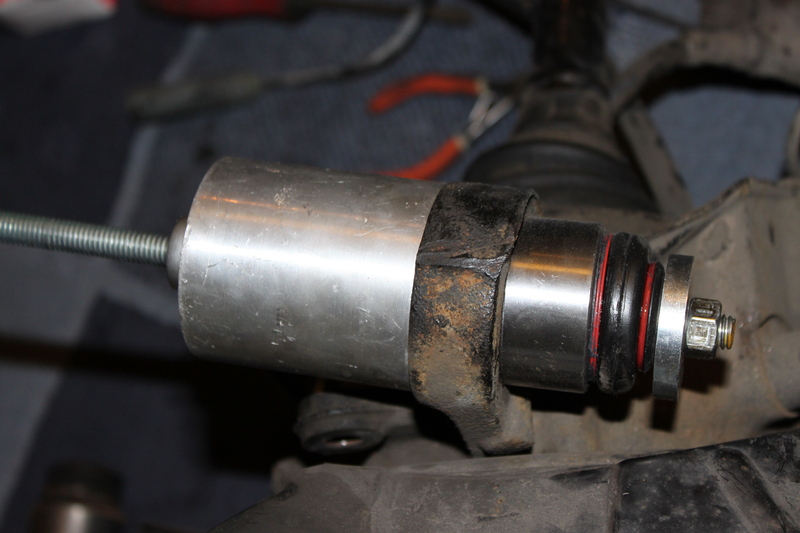 Here you can see the AKG diff removal tool being used for the upper rear control bushings on the E36 M3. This picture shows the process mid way through. The bushing removed from the e36 hub. Old and new balljoint comparison. Pressing in the new balljoint. Some bushings go in a lot easier than they were removed, as you don’t have to break free 15+ years of rust, and sometimes nothing more than a rubber mallet is needed for reinstallation. Leave the new bushings in your freezer over night to help with the install. Here i’m getting ready to press out the upper bushing. The tool is oriented in this direction to catch the outer race of the bushing as the inner portion compresses under the force of the press. A larger washer is needed here with a diameter of at least 4.5 mm. Here is where the 1/2 threaded rod comes into play. Since some bushings are easier to remove than others the 3/8ths rod I was using worked on some, however it ultimately failed on the bushing that were stuck in there. Prior to doing this job I recommend soaking the bushings and ball joints in PB blaster or a similar rust eating formula. 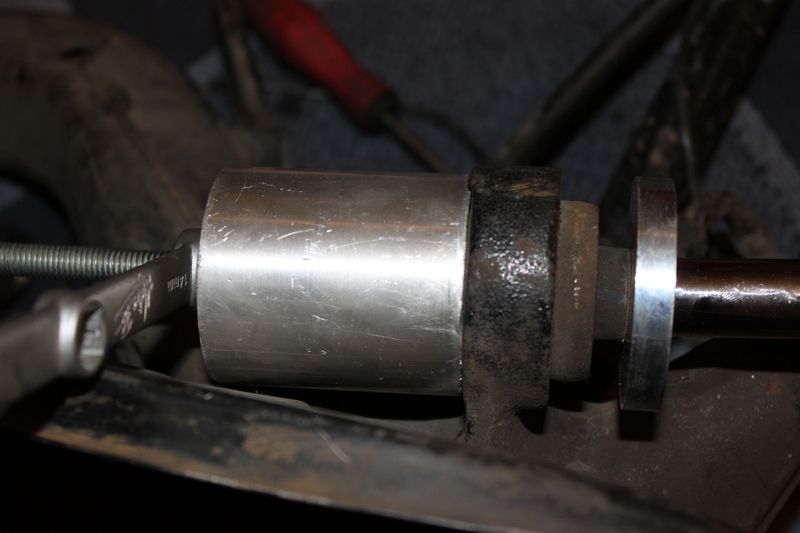 While the 3/8ths rod fits through the balljoints and bushings just fine, the 1/2 inch rod is slightly to large. I had to drill out the inside of the bushings with a half inch drill bit in order to fit the rod through. It only took a few seconds as the difference in size in marginal. When reinstalling it’s necessary to use the 3/8th rod again, as you do not want to drill out the inner diameter of the new ball joints. Pressing the balljoints back in goes much more smoothly than removal, and the 3/8th rod is adequate for the pressures involved. You can see the 3/8th rod snapped in half here on this stubborn bushing. No sweat, here you can see the upgraded 1/2 threaded rod easily holding the pressure required to force the bushing free of the rear hub. Alternatively with the hubs removed from the car you can use a hydraulic press to really simplify the process. Repeat for the process for the other side. That’s a really good price for the lemforder bushings.